The great blue heron is a beautiful bird: tall and statuesque when wading in water searching for prey, graceful and swift in flight. It is truly one of North America's most majestic wild birds. 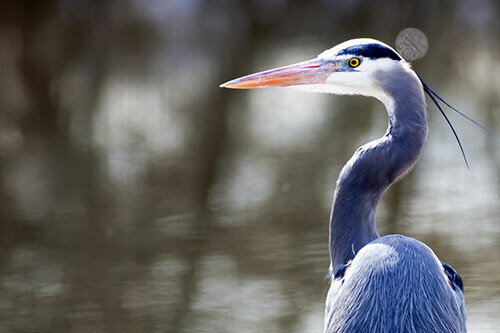 The Great Blue Heron (Ardea harodias) is a tall, bluish gray wading bird with spindly legs and a graceful s-shaped neck. 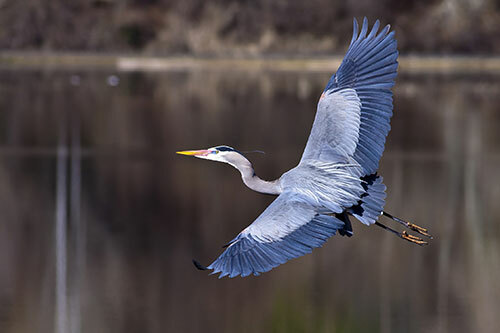 American Expedition is proud to present Great Blue Heron information, facts, pictures, artwork, habitat information, and nesting behavior for this amazing marshland bird. Great blue herons get their name from the grayish blue coloration of the feathers on their upper wings, back, and tail. Their face is nearly white, with a pair of black stripes running above their eye to the back of their head. They have gray necks, with white and black streaks. The great blue heron is the largest North American heron, with a height of 3-1/2 to 4-1/2 feet and a length of 3 to 4-1/2 feet head to tail. They can take large steps for birds, with a stride of around 9 inches in a straight line. The great blue heron has a very large wingspan, measuring between 65 and 70 inches. Great blue herons weigh between 4.5 and 8 pounds. Herons are very cautious birds, and will often take flight once they have spotted something that they perceive as a threat. They will beat their wings hard while taking off, and then catch winds and glide, gracefully cruising at speeds between 20 to 30 miles per hour. Herons spend approximately 90 percent of their waking hours stalking for food. 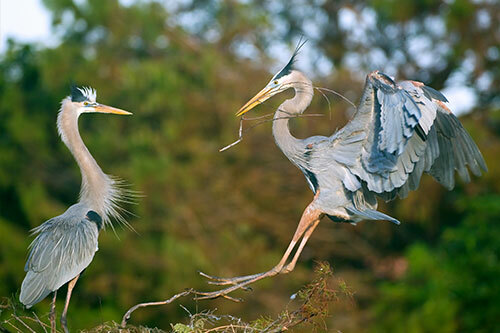 Great blue herons are monogamous during breeding season, but will choose a new partner the next year. When alarmed, herons may make make 3-4 hoarse croaks to warn others before taking off. Not all great blue herons nest in trees - some herons are ground nesters, and will use grasses to build their nests instead of sticks. 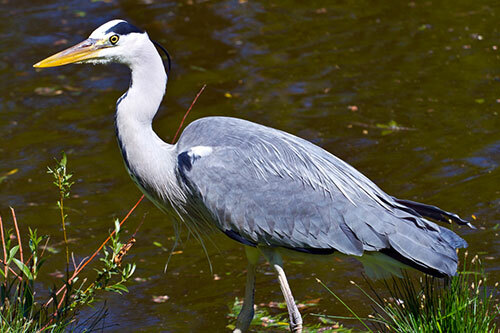 Herons have been known to congregate at fish hatcheries, creating problems for fish farmers. The feathers on the chest of the great blue heron are highly specialized and will continually grow and fray, kind of like a powdery down. Herons will use their chest feathers to remove slime and oils from their other feathers as they preen. Great blue herons near the ocean will often sit on floating kelp and plant materials and wait for fish to float by. There is a form of great blue heron in Florida, the Caribbean, and the Yucatan Peninsula that is solid white, known as the 'Great White Heron'. White herons and blue herons may interbreed, and the offspring are known as "Wurdemann's herons'. 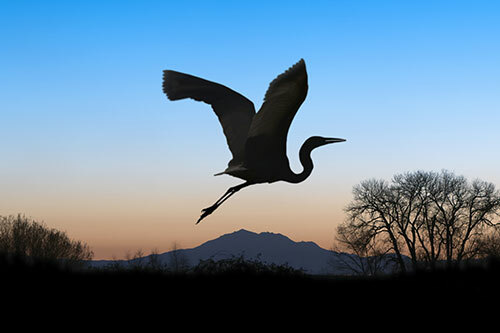 Some herons are migratory, and will travel day and night while migrating. Great blue herons will hunt both during the day and the night. They have specially adapted eyes which help them to see in the dark. A heron will typically live for around 15 years. The oldest recorded great blue heron lived to be 24 yars old. Great blue herons can be found throughout North America. They are year round residents in the southern part of their range, which includes most of the United States and Central America. 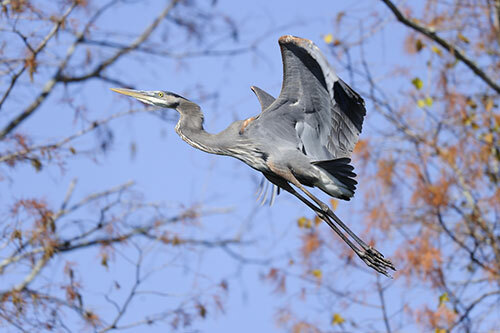 Great blue herons may migrate north for breeding purposes. Stray herons have been found very far away from their normal range, in various places such as England, Greenland, Hawaii, and the Azores. Great blue herons are remarkably adaptable birds, capable of living in almost any wetland environment found in their range. They can be found in mangrove swamps, flooded meadows, lake edges, riverbanks, ocean shorelines, and fresh & saltwater marshes. They are shy birds, but may be found in heavily developed areas which hold bodies of water containing fish. Herons prefer to stay close to water, but will fly over areas of dry land to get from one body of water to another. Great blue herons primarily feed on small fish, but they are opportunistic feeders and will eat whatever comes within striking distance. They occasionally snack on shrimp, crabs, small mammals, amphibians, small birds, rodents, and insects. Herons wade slowly while stalking their prey in shallow water or flooded meadows, and will strike using their neck to throw their sharp, daggar like bill at their prey. Herons may also grab prey with their beaks, using their strong jaw muscles. Herons will often shake fish once they have been stabbed to break the sharp spines before attempting to swallow it. Herons swallow their prey whole, and have been known to choke on very large meals. While feeding, herons are typically solitary birds. Great blue herons usually breed in colonies from February until May, setting up nests in trees that are close to wetlands. These colonies are called a 'heronry' and average 160 herons (although colonies may range in size from 5-500 nests). Herons build their colonies close to feeding spots, typically staying within 2 to 3 miles from a good source of fish. Herons build their nests with sticks, and will gather nesting materials from nearby forests, carrying them back to the nesting ground. 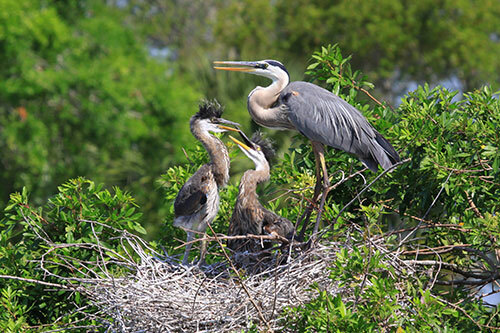 Great blue heron nests may measure 4 feet across, and be up to 4 feet deep. Great blue herons may re-use nests from previous nesting seasons (and expand upon them) rather than build a whole new nest. Once the nest has been built, the female heron will lay once clutch of 3 to 6 eggs (although, if the first clutch is destroyed, the female may lay a replacement clutch). Heron eggs are incubated for around 28 days before they begin to hatch. Heron eggs will not hatch all at once - instead, they hatch asynchronously over a period of several days. The first chick to hatch will often become more experienced at handling food, and will usually be more aggressive than its siblings and grow quicker. Great blue herons are wary of humans, and will abandon their nesting grounds if humans intrude on their colonies. For this reason, if you find a heron nesting ground, it is best to back away slowly and quietly and stay far away from the nest. Great blue herons look quite elegant in flight. Here, a pair of great blue herons can be seen coming in for a landing at their nest. 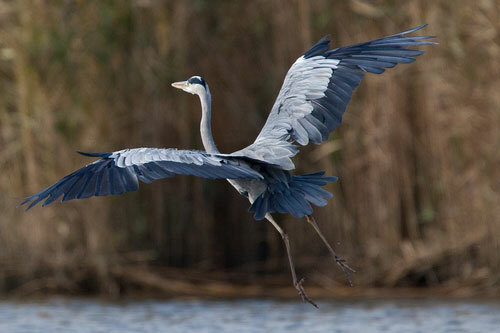 Great blue herons can glide at a speed of up to 30 miles per hour. Great blue herons spend up to 90 percent of their waking hours hunting for food. You wil notice that most of these heron photos feature the birds in flight. Herons are very wary of humans and will often take flight upon first spotting them. Herons typically live around 15 years. Great blue herons have a well-earned reputation for being graceful, beautiful birds. Herons will use their sharp, daggar like bills to stab at prey. Great blue herons are wary of humans, and will abandon their nesting grounds if humans intrude on their colonies. 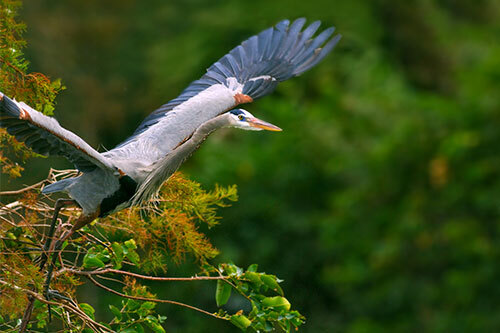 Great blue herons will build their nests in trees, using sticks. Some herons are ground nesters, and will instead use grasses to build their nests. Great blue herons will lay 3-6 eggs per season, but typically only 1-2 young will survive. Join our email list and receive a free wildlife gift!